Fellow author Jeaninne Stokes and I recently corresponded about a common question: How do you keep from getting distracted by your writing while writing. Specifically, if you’re working on chapter three, how do you keep from going back and fixing something in chapter one without getting stuck in chapter one again? Just so you know: I am not the queen of staying-on-track. However, I have devised a few tricks that keep me from getting completely derailed when I write. 1. Write description later – If I’m writing a restaurant scene and I have no idea what the restaurant looks like, but I know exactly what I want my characters to say to one another at their table conversation, I skip to the conversation because I don’t want to mess up my flow. I make myself a note in the text (see below) and then I come back through and describe the restaurant when I revise (which is AFTER I finish the entire first draft). By the time I start revisions, I probably will have gone out to a restaurant with my friends and thought, “Oh! This looks like the kind of place for that scene!” and then I’ll insert the description. One note: Now that I’m more conscious of using “character as setting” thanks to my critique buddy Lynne Gentry, I want to make sure to include details that add to the mood of the scene. 2. Research small things later – If a character was born on a Tuesday in October of 1947, I may need to know an actual date so I’m going to have to look this up. But if I stop writing and skip on over to the internet to look up the 1947 calendar, there’s a good chance I’ll get distracted by a whole bunch of stuff that took place in 1947 and I really don’t need to be in the internet at that moment. So, I make myself a note within the text (like above) and come back to it later. The internet is probably my #1 distraction when it comes to writing. I try to stay off of it when I’m composing. 3. Keep a document called “Things to Fix Later” – While I’m working, I keep another word processing file open entitled “Things to Fix Later.” Every single book I’ve written has had such a file in its folder. In that file, I keep notes about what needs to change in a previous chapter now that something relevant has unfolded in a later chapter. 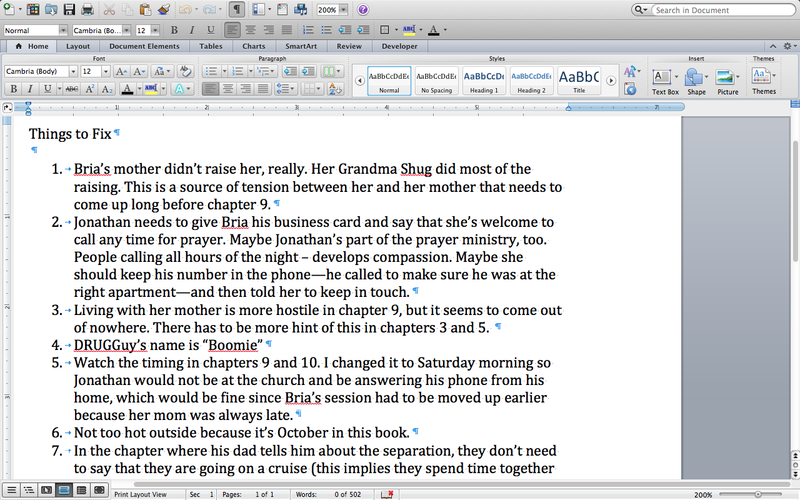 Even if I have a pretty good outline, things still change as I write. (Spoiler alert – the picture below is from my book The Start of a Good Thing. Screen shot of my list of things to fix. When I go through the revision process, I fix these issues. Okay, my fellow authors, that’s all I have to share for today. I hope these little hints will help you make your way to the final chapter! Please feel free to add to the conversation in the comments. I admire this author so much, so when I saw this article I clicked on it immediately. I’m on cloud nine right now because all this great advice here…I adhere to already. So I guess I am doing something right. Also you might wanna try Michelle’s book…she is the business for real. Thanks for sharing, sis! Much love! Thank you!!!! I will take heed to this!!! Thank you for the post and the advice. Distraction is my weakness. Glad this was helpful to you! Thanks for the re-blog, too! Practical advice and tips from a seasoned writer. Check it out, you won’t regret it!